Not sure if this is just a North Carolina thing..(most likely NOT!) but theres def. this unspoken Jeep Wave.. so i was just wondering what your wave consisted of? I only wave at lifted Jeeps or return a wave if initiated by stock Jeeps. When I lived in WI Wranglers weren't that common and I waved at everyone and they returned the wave. Here in NC everyone and their grandmother has one so I don't bother waving at stock Jeeps because they all end up with that confused look. I also wave at any other vehicle that obviously sees off road duties. It's an off road thing, not a Jeep thing. Yah def agree there..I don't give stock Jeeps the wave either unless they initiate it... as for other vehicles..I only really wave at other Jeeps..i.e cherokees that are lifted cause lifted trucks around here don't impress me at all..everyone and there brother has one lifted and they all seem to be really good at getting them stuck too..and it doesnt take much to spin the tires and throw a little mud on it...I'm going to keep it a Jeep thing..
"The danger to America is not Barack Obama but a citizenry capable of entrusting a man like him with the Presidency. It will be far easier to limit and undo the follies of an Obama presidency than to restore the necessary common sense and good judgment to a depraved electorate willing to have such a man for their president." i only wave at jeeps driven by hot girls.....anyone else on the road usually gets this..
i got tire and a bb lift the first week, just to wave, or ger one in return. i think the general wave here in GA, at least south GA is just to lift your hand off the steering wheel be flexing your wrist upward and picking up your pointer and birdie finger. thats just for some reason how everyone i know waves at other people when ridin down the road. when i'm in town i wave at all the jeeps i see. but when i'm in the country you dont see a car all that often so we kinda wave at everyone. over here some people wave and most dont. 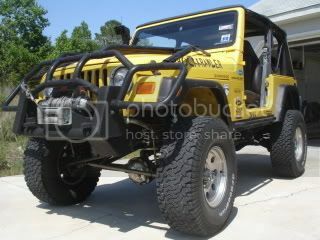 There are many modded wranglers that DONT WAVE. I gues they think of me as competition and look at me pissed off. Chicago's ignorant people make me sick. I'd say that about 98% of the Wranglers around my parts wave, 1% are just not paying attn. to wave, and the other 1% are too busy "being awesome" to care. Buy most of the Jeeps here wave. And for me, it's my left hand/arm out the window, rain or shine. A conlusion is just the place where you got tired of thinking. 90% of the JK's around here look at you funny when you wave. other tj owners wave back but there are a few that don't. its still no reason to not wave at a stock jeep, eventually they might catch on. as for my wave the i just lift the pointer and middle finger off the steering wheel. Dear Algebra, Please stop asking us to find your X. She's never coming back and don't ask Y.
I am in a small town and everybody waves at everybody else but when I am going down the road out of town I just kind of throw up a hand unless they wave first then I stick my arm straight up if the top is off. I like for it to shine even thought it is muddy most of the time! Lemme see...I don't have a lift but I do have grill guard,rock rails,tinted windows,stickers and P235 Bridgestone AT Dueller tires on mine. How's topsail's beaches this year..I hit up Emerald Isle yesterday..just closer for me because I live in Hubert..good to have a local Jeeper in here though! Awesome...would you write me a ticket too? its funny the "wave threads" always get funny, and lots of response.. haahhaah it never gets old..
NOPE! I'll never ticket a Jeep. Hell, if I could have a YJ Police Interceptor I would! my point exactly, for a few years i didn't have a lift or any after market parts but i would still wave. a jeep owner is a jeep owner whether he has a stock jeep or not, non reason not to wave. if they don't wave back who cares. man on motorcycles its like quick draw mcgraw.. Wanna see who can throw the first wave.. Stock jeeps are like harley riders they barely wave back. too into the image u know.. a jeep snob or a tough harley rider.